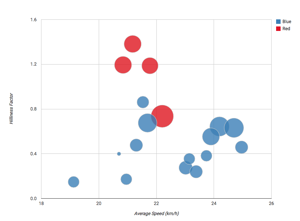 Explore Corallian Cycling Club ride data using the four dimensional Data Visualisation tool. Browse all the photos uploaded to Corallian Cycling Club ride reports in the Photo Gallery. This season 35 club members have ridden on 45 rides and have cycled a total of 16,740 km. This is an average of 478 km per member. Click on column headings to sort table. Click on column headings to sort table. Click on a name to see detailed rider stats. There have been 59 club members on 252 rides who have ridden a total of 95,980 km. This is an average of 1627 km per member. Click on column headings to sort table. Click on a name to see detailed rider stats. = current member. Club records are for interest only. The club does not seek to set or beat records.